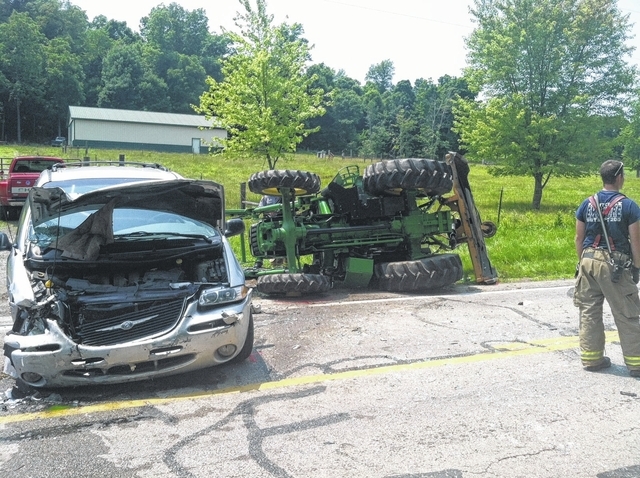 Two people were airlifted following a crash Saturday on SR 73 involving a vehicle and a tractor. One person remains in the hospital and another has been released following a Fourth of July accident that left the drivers of two vehicles seriously injured. At approximately 1 p.m. Saturday, Jade Kingsolver, 30, of Hillsboro, was driving a Chrysler Town and Country van northwest on SR 73, south of Hillsboro and just north of Patton Road, at the same Robert McLaughlin, 58, of Hillsboro, was driving a John Deere tractor northwest on the same road. According to the Wilmington Post of the Ohio State Highway Patrol, McLaughlin was attempting to make a left turn into a driveway at the same time Kingsolver was trying to pass McLaughlin’s tractor. The state patrol said the van basically T-boned the tractor. Both men received visible injuries and were flown by helicopter to UC Medical Center. According to Branden Jackman, public relations officer for the Paint Creek Joint EMS/Fire District, all occupants were out of the vehicle upon the arrival of emergency personnel. Early reports that the tractor driver had been pinned under his vehicle were not accurate, Jackman said. Kingsolver was still in the hospital Monday afternoon, while McLaughlin had been discharged, a hospital spokesperson said. No other information on Kingsolver’s condition was available. The state patrol said Monday that no citations had been issued and that the accident remains under investigation.